Hello! 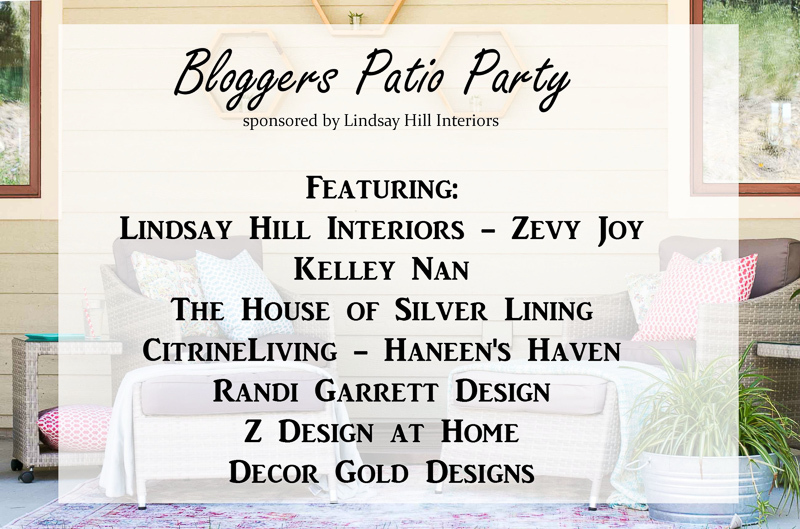 I’m so glad you have decided to visit our Bloggers Patio Party Tour! The talented Kathleen of Lindsay Hill Interiors is hosting us today and I’m truly grateful she included me! Kathleen has an amazing website and she was actually the first to share my home on her blog…so fun to look back and realize how many changes I’ve made over the past months! 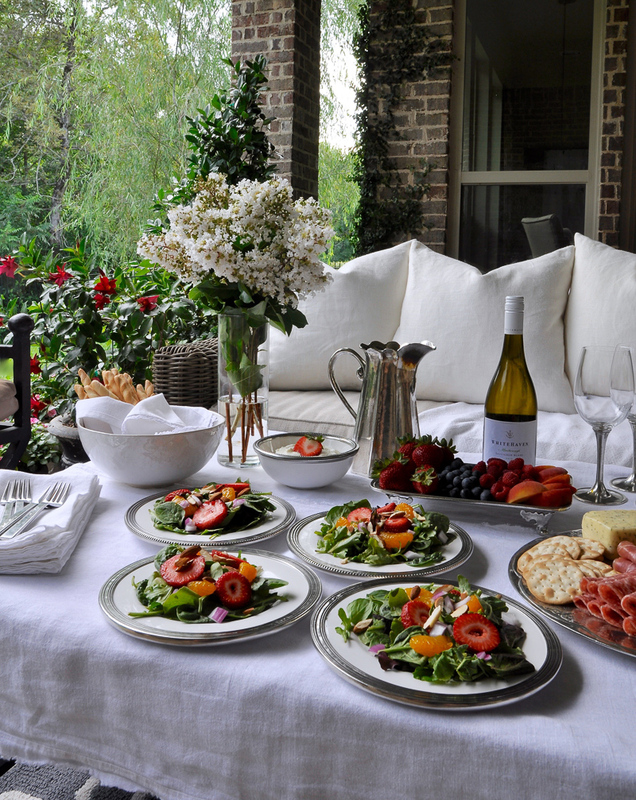 So, you want to host a summer dinner party. We absolutely love hosting parties. But, then we realize what we have gotten ourselves into. We begin thinking about the sheer volume of decisions which need to be made. As you can imagine, it can be overwhelming. However, in a moment I will share with you how you can streamline this process and pull off any party you have committed yourself to. When my husband and I decide to go out, invariably the conversation centers around what we are in the mood for food wise, as well as the ambiance of the restaurant. Truth be told, the latter may lean a bit more heavily in our decision making process. 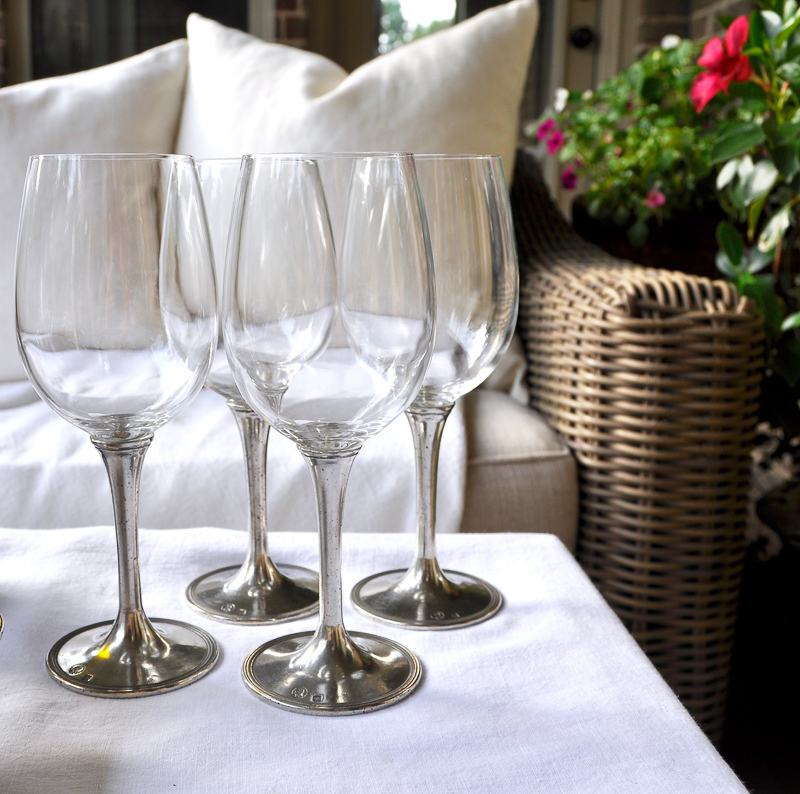 The “Five W’s” are always a great place to start to ensure you stay on point when planning for a dinner/night out as well as hosting your own dinner party. Who – Is this going to be a family style gathering or is it primarily going to be for adults? What – Will this be cocktails and appetizers or will it be a several course dinner? Any specific theme? Be sure and share the menu with your guests ahead of time. When – Beyond the date, it is important to let your guests know the duration of the event. Plan on 4-5 hours at a maximum. Where – Will this be hosted indoors, outdoors or both? Why – Any relevant specifics need to be shared here (milestone, event, etc). Now, the above starting points help guide the entire process for the evening not only for yourself, but it also allows your guests to plan accordingly. Be sure and spell out these points clearly for those you invite. Beyond the Five W’s, the most important components for this party will be the five senses. You want the entire experience to be visually stimulating. From the look of the food to the look of the table. No detail can be overlooked. 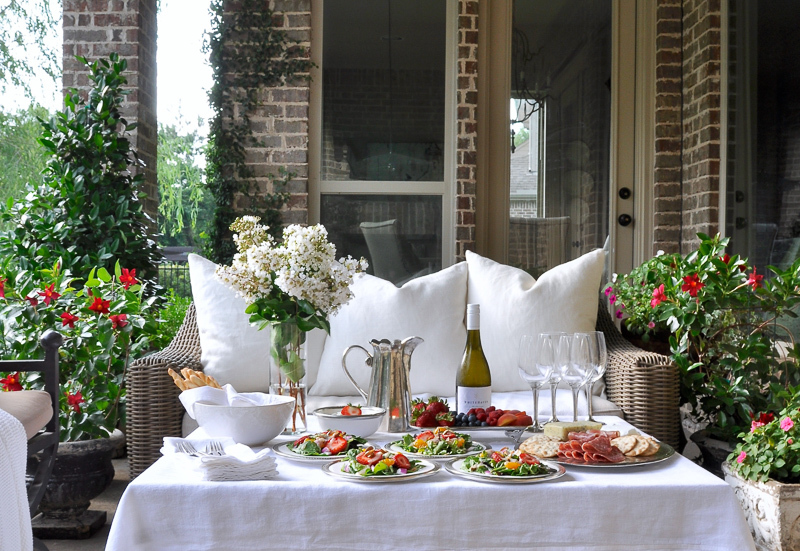 When we host parties, we try to keep it elegant yet simple. 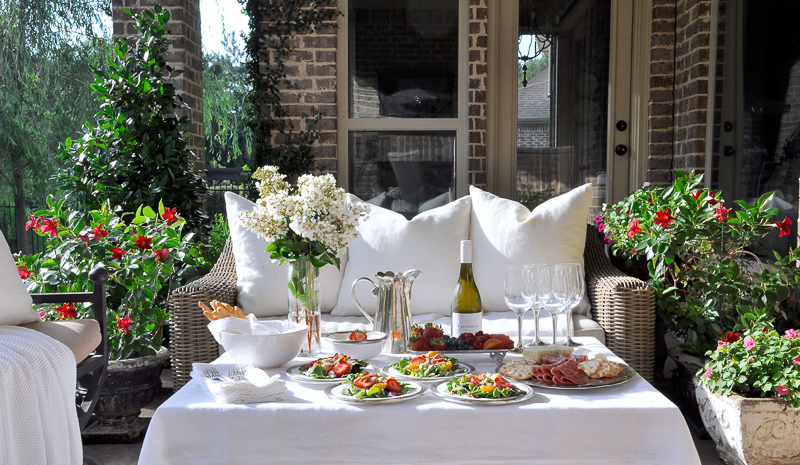 For example, a white linen tablecloth works well indoors and outdoors. 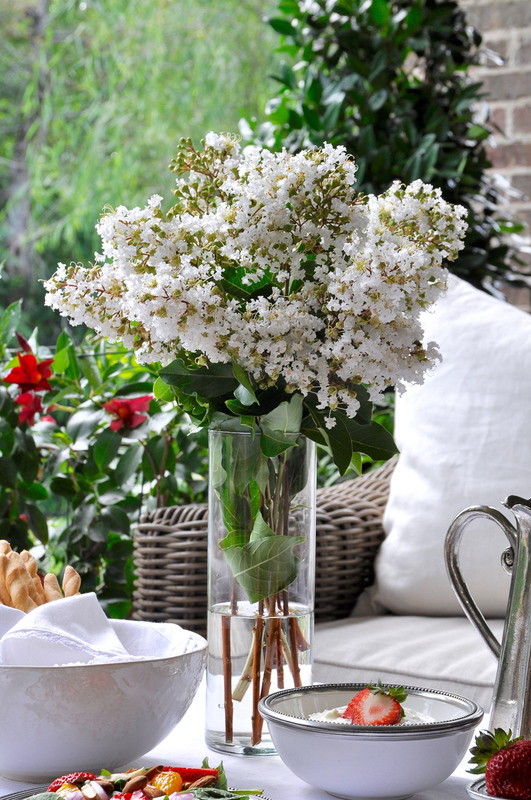 Also, crisp white flowers on the table will work with any color scheme you may have. I clipped these from my crepe myrtle shrubs as you may have seen me do recently in my summer tour. 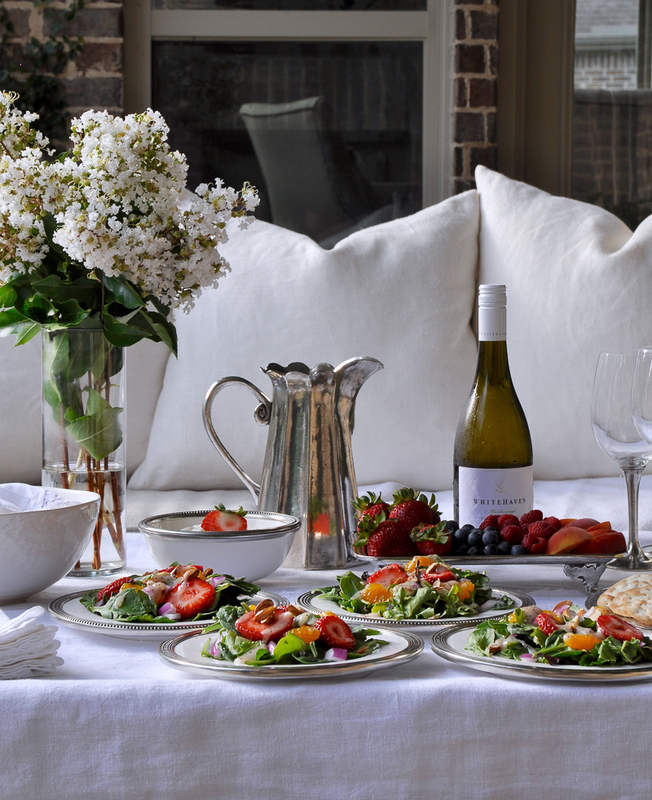 Classic white dinnerware is always our choice. Noticing a theme? Always try to keep the background neutral. With a neutral background, the vibrant colors of the food and accompaniments will be that much more appealing. I swear the contrast makes the food taste better! 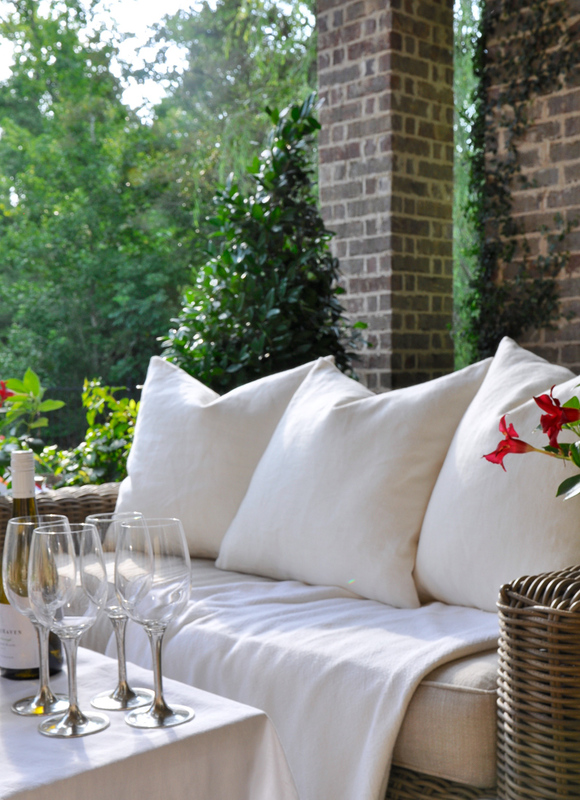 When hosting outdoors, be sure and string together some outdoor lights for ambient lighting. We keep ours up year round and just love them. 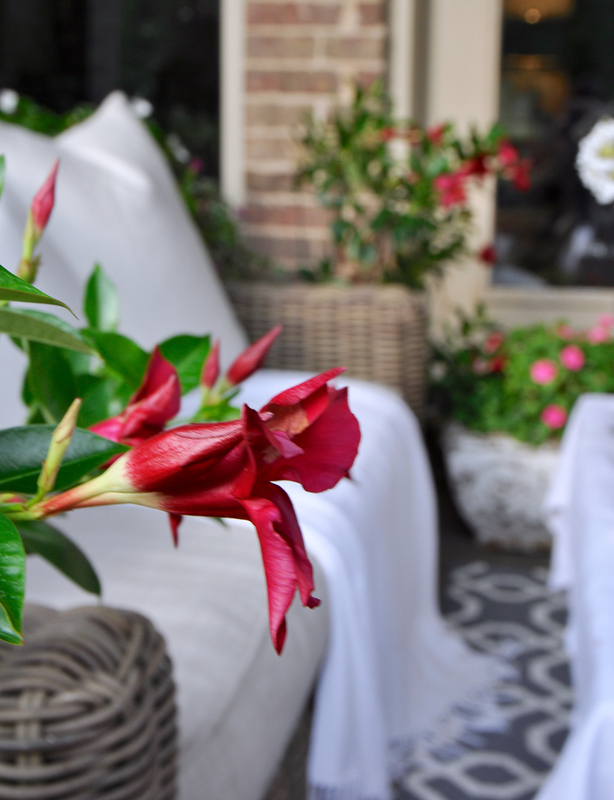 Ours are located just outside the patio, but here are a few choices you will love. Speaking of ambiance, the music choices should be classically familiar but not too loud. 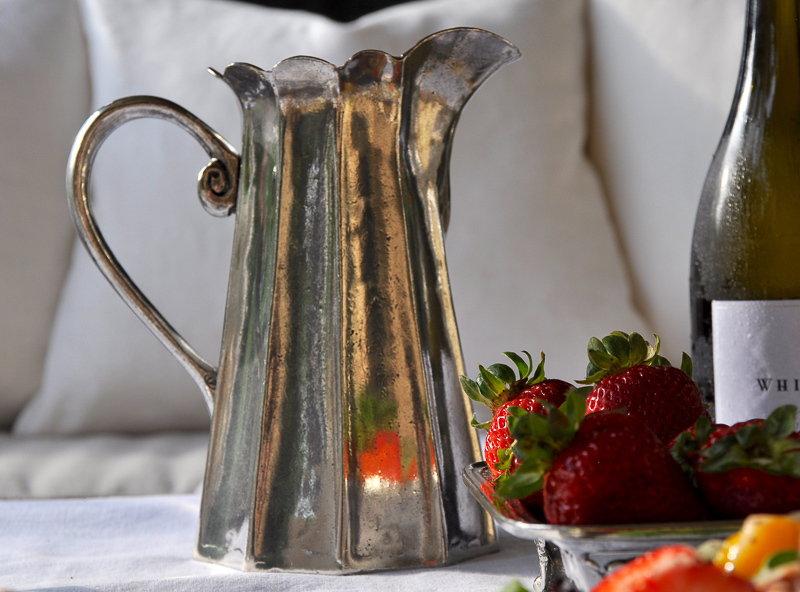 I always keep plenty of refreshments outside and what better serving item than this stunning pitcher. The beauty of it literally took my breath away at first sight! Additionally, the glassware is also very special. 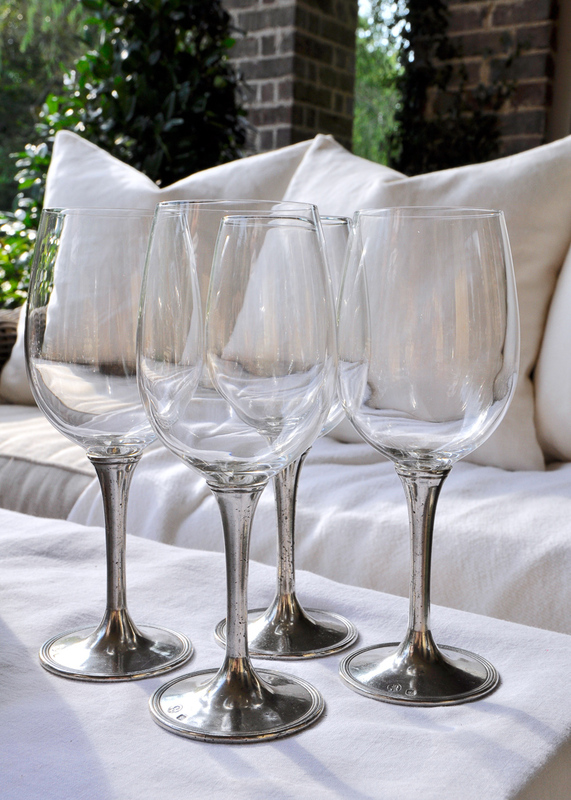 Don’t you just love the handcrafted pewter stems? 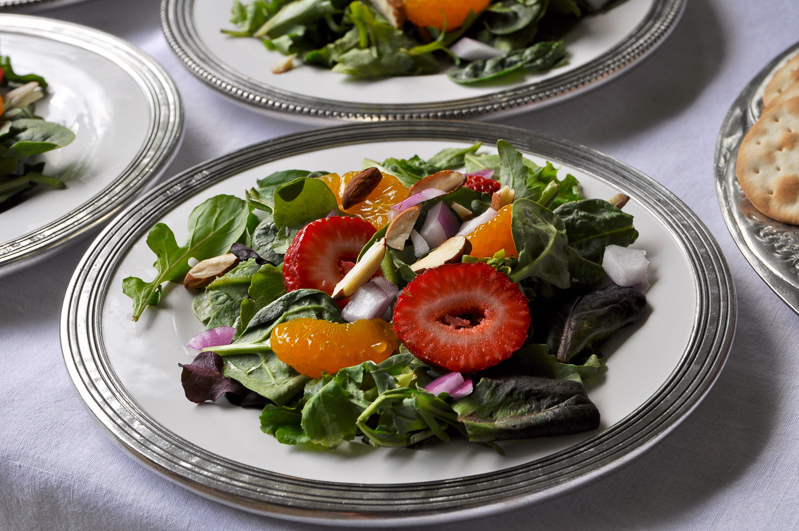 Below, I used beautiful salad plates to coordinate with the glassware. If you look closely, you will notice there are two styles. You can find them here and here. You don’t have to only use matching pieces. It is much more fun to mix and match, especially in a setting such as this. 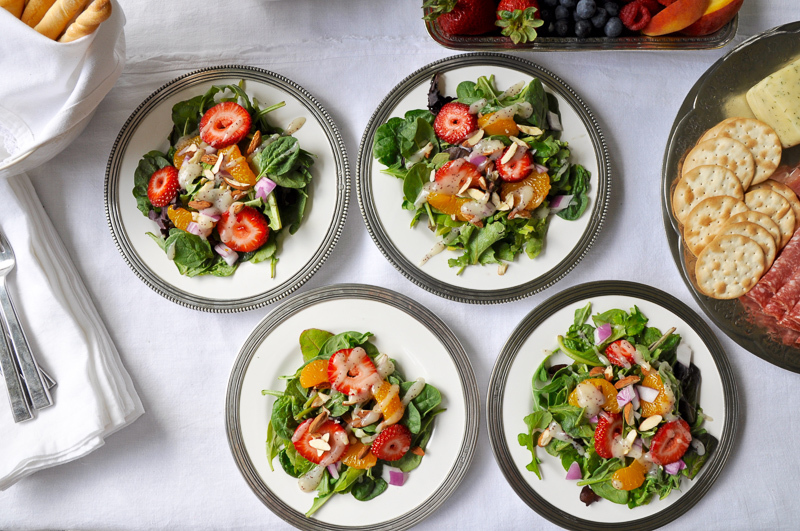 The salad is simply fa combination of field greens, strawberries, mandarin oranges, red onions, almond pieces, and poppyseed dressing. It is perfect for summer! 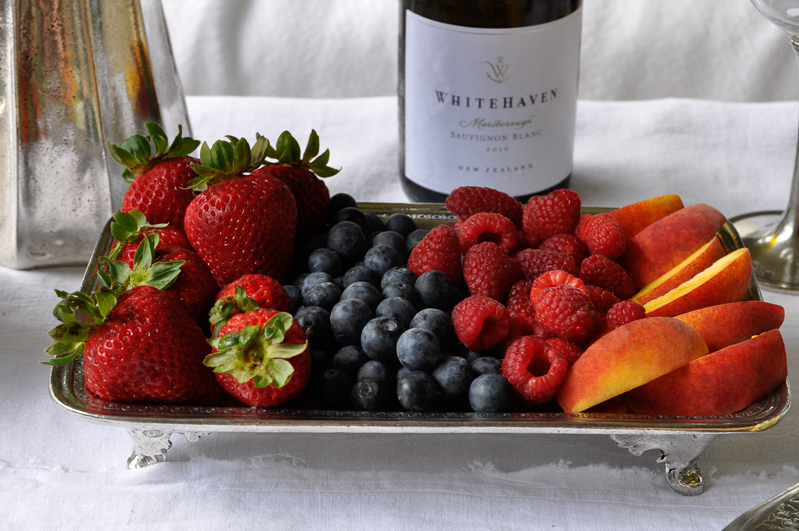 I love the color fruit adds to a summer table. I served it on this lovely pewter piece. 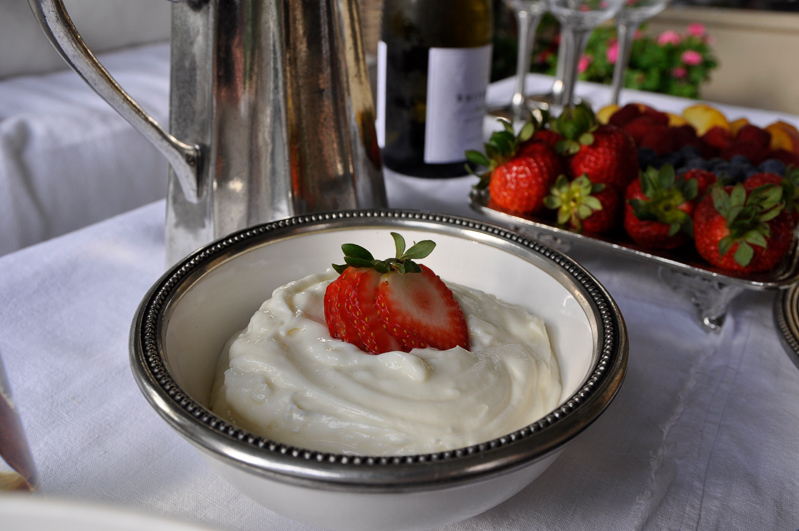 I added a sweet dip which is so easy to make. It is made of one part cream cheese and one part marshmallow cream. I love how it looks in this gorgeous coordinating bowl. When everything comes together, the look is quite inviting and appetizing! Hosting a dinner party should be a fun affair. With a little planning and some utilization of the above tips, your guests will think you are a professional party planner. The next stop is our host, Kathleen’s post. Enjoy!!! Thank you for visiting! If you will like to receive weekly emails when I have posted a new blog post, please subscribe here. Oh Jen – how I wish I could come to one of your amazing parties! Your ideas are wonderful, and the setting is absolutely breathtaking! 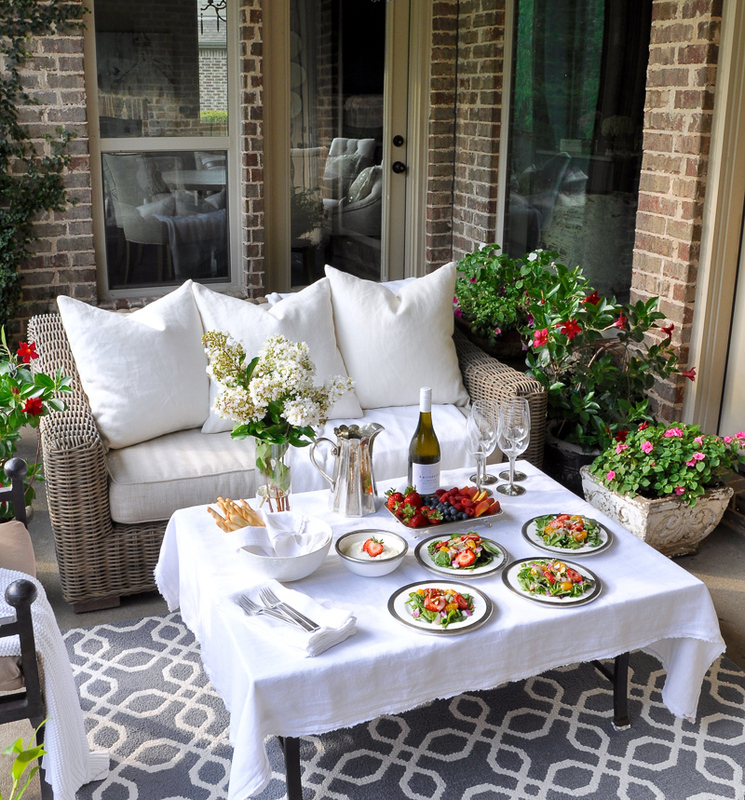 I just love how intimate and cozy your patio looks while still maintaining your elegant style. Love, love, love!! Thanks so much for joining me on this little tour – you always add a special touch, and I love getting to work with you! Thank you Kathleen! How kind you are sweet friend! You made this blog hop an absolute pleasure and I’m flattered and grateful to be included! This is breathtaking Jen! Your porch and those dishes are stunning! Why can’t we be neighbors?!!! You are the sweetest Randi! You never know…maybe we will be neighbors someday! Thank you Bree! I’m so glad I appreciate your kind words about the dinnerware…Arte Italica pieces are amazing! Thanks again sweet friend! Everything looks so dreamy and fresh…love your pictures! The setup, the salad, everything looks amazing! Oscar! Thank you so much my friend! You are so kind to visit and leave such a generous comment! Thanks again!!! That is one incredible looking table… and that pitcher is divine! Thank you so much Shannon! That means a lot coming from you my friend! And yes, divine!!! I am beyond WOWED by this Jen! So elegant yet inviting. 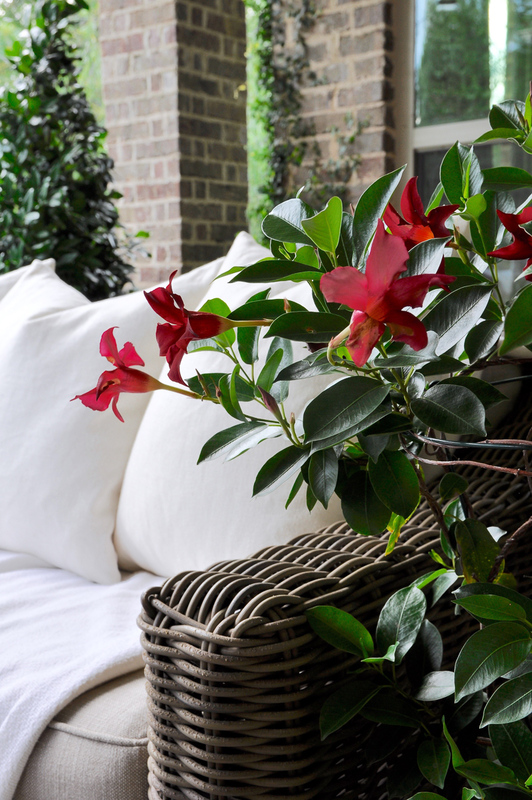 Love your outdoor sofa, it looks so cozy! You’re photos are effortlessly beautiful as always! Can’t wait to see you next month my friend! Jennifer, how very stunning! I love getting to see what you will do and how you add your touch to your beautiful spaces indoor and out. The spread on your table looked so pretty and delicious all at the same time. Wonderful job friend!!! Annie, you are so kind! I feel the exact same about you and your beautiful spaces. Your taste is impeccable and I can’t wait to finish the tour tonight and see the rest of your stunning photos! Thanks so much Kelley! Aren’t they special? I could barely get through unpacking them because I was so excited! You inspire me too! Every single day! Thank you so much sweet friend! I have loved everything you’ve posted on Instagram and I’m headed over to read the whole post soon! Can’t wait! Oh my girlfriend! Stunning in every way. I can totally picture us sitting there together, sipping wine and having a lovely, long chat. What a beautiful day that would be!!! Oh my gosh Paula! You just made my weekend!!! Thank you so much! And as far as the dinnerware and pitcher, Arte Italica deserves all the credit. Their piece are the most gorgeous I’ve seen! Thanks again and have a wonderful day! Gorgeous setting…I can appre iate al the work you went through. We also luv to have our friends over…mostly during the summer months when we can use our backyard, we can accommodate about 24 people. we have a lawn area, a 2 level deck, a brick patio and an enclosed (screened in) area that we luv to call our ‘florida room’. But last July was our 50th wedding ann. and we had a guest list of 52 people..no way we could fit all these people in yard, let alone in our bungalow..so we decided to have a picnic in a vineyard..under the big top! We did not want our family and friends to spend $$ to come celebrate with us..so on the invitation we ask that they bring their own picnic basket..just that…we would supply the rest. So we had pink Champagne (from the vineyard) with excellent hot and cold hors d’oeuvres (5@ person) ..hand made just for us at a local Belgium Pâtisserie. To accompany lunch (noon to 5.00) there were white, red and rosé wines. The dessert consisted of individual fruit tarts (1 per) …. (size of a small plate) also made at the Pâtisserie and to wrap it all we had a Port style wine accompanied by 3 different kings of cheeses along with red & green grapes and some almonds. great day..no complaints re food!😉 but a lot of planning. We had 6 tables of 8 (with white linen tablecloths- came with rental of bug top) and our family table of 12. We hunted down 30 mini vases for flowers, white, green & mauve (for vineyard), we had square white plates for lunch and smaller gold plates for hors d’oeuvres & desserts, the utensils ,napkins and coffee cups were also in gold. The glassware was,supplied by vineyard . The vineyard is open to the public on w/ends..there motto being ‘bring your picnic but not you’re wine’! hence the idea of a picninc! They have outdoor speakers with classical music but we were allowed to bring our own cd’s.Our guest were supposed to have a guided tour of the vineyard in the afternoon but we renewed our vows, our pastor being our friend, and by the time that was over…we had a diluge!! Rain coming down like crazy..we even had little green frogs trying to come in the tent😉😉 But we had a great time and our guests appreciated bringing there own food and all the effort we had out into this celebration….We started planning on January 4th 2016 for July 23rd..e got there in time! So all this to say ” you are right aboutthe 5 W?..and it does take A LOT OF PLANNING AND A LOT OF WORK! Hello Renee! What a great party that must have been! I hope you took lots of pictures and enjoyed every moment! Happy Anniversary to you….so wonderful! Thank you so much for sharing!